The author is the technical service manager for Calibrate Technologies. It’s harvest season and high-quality alfalfa is at the top of your mind. You have the necessary equipment and labor for a timely harvest, you’ve planted the best alfalfa variety, and your stringent cutting schedule is marked on the calendar. The plan is set. But then a week of rain wreaks havoc on all your good intentions. Sometimes things don’t go according to plans, including harvesting high-quality alfalfa. So what can you do when Mother Nature imposes her will? Here are some ways to help deal with alfalfa when a harvest delay or other factors cause you to question forage quality. There are a lot of options when it comes to alfalfa quality tests. From total digestible nutrients (TDN) to relative feed value (RFV) to relative forage quality (RFQ), each test is calculated from nutrient constituents predicted through a near-infrared (NIR) analysis and use different calculations with different variables. Not only is there a wide range of available tests, but also results vary within the tests — especially when forage quality is unusually high or low. In the figure, the vertical bars represent a typical frequency distribution of a lab’s results for alfalfa fiber digestibility tests. The light green bars at the ends of the bell curve represent where alfalfa fiber quality is either unusually high or low. The analysis accuracy of these extremes is financially critical to help determine what steps are needed to rebalance the diet. For best results, test all forages with an accurate NIR alfalfa quality test; one based on a sample set representing a wide range in forage quality. This will help ensure rations are adjusted accurately and identify those forages that are at the extreme high or low ends of the quality spectrum. Pinpointing the exact amount of digestible fiber in your alfalfa will help determine how much supplemental forage you will need to balance ration fiber levels. For an accurate measurement, test for neutral detergent fiber (NDF) and neutral detergent fiber digestibility (NDFD). Do this in conjunction with analysis for other essential nutrients. Knowing the NDF and NDFD of alfalfa fed can help maintain intakes and reduce the chances for a drop in milk production. When forage NDFD is high, more fiber can be included in the diet without creating excessive rumen fill, which can reduce intake. However, when forage NDFD is low, reduce inclusion levels in the diet to avoid excessive rumen fill. This could raise feed costs if the by-product feeds used to fill the resulting space in the diet are more costly than the alfalfa being replaced. 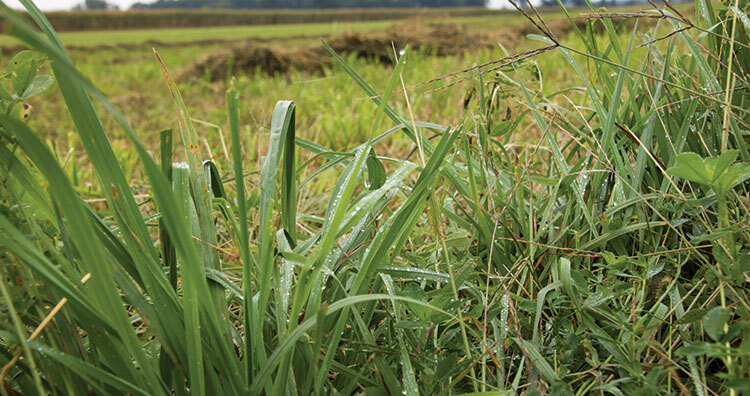 It is likely that not all of your harvested forage is poor quality. Utilize all the high-quality alfalfa for cows that are in peak production. Then, depending on the amount of alfalfa affected by a rain-delayed harvest, there are a few different ways to work it into other rations. Work closely with your nutritionist to determine the best course of action for your farm. These forages can likely be used for older heifers, dry cows, or in low-production rations. Another option would be to sell it to someone who has a use for lower quality forage and then purchase additional higher quality forage. If you decide incorporating lower quality alfalfa into your lactating herd’s ration is necessary, knowing the exact NDFD of the alfalfa will help better determine how much you can include in the diet without compromising intake and milk production. Work with your nutritionist to balance rations more frequently, and make sure new ration formulations are in place before the feed is fed. Reduce the amount of hay in your ration. Reduce the total forage level in the diet, and fill the resulting space with high-fiber supplements such as ear corn, soy hulls, whole cottonseed, brewers grains, corn gluten feed, or beet pulp. Ensure that dietary metabolizable protein levels are not compromised, since lower quality alfalfa can also be low in protein. This article appeared in the April/May 2017 issue of Hay & Forage Grower on page 31. Not a subscriber? Click to get the print magazine.